By Carl Glaum of Milwaukee, USA. As with other branches of the family our research into the North family has turned up many interesting facts and debunked some of our family’s myths. Two of the bubbles that were broken early on were stories dealing with royalty. The first was a long-held belief that the Norths were very tall and had served as Queen’s Guards. I guess this myth stemmed from the unusual height of some of my American uncles. Research has shown that, given our ancestors’ professions, they were more likely to be the Queen’s Gardeners rather than the Queen’s Guards. The second myth was some highly dubious and sketchy connection to the infamous (at least to the US perspective) Lord North of American Revolutionary War fame. While this myth can be attributed to a natural desire to have the family tree rooted in nobility, I for one am glad that our family is not connected to this less than distinguished (again consider the point of view) character in American history. Through the initial research done by my cousins (Kristine from Chicago and David from the Washington DC area) that entailed long hours of sifting through rolls of microfilm and organizing early stories of immigration and births, we were very happy to confirm the family’s origins in Peterborough, Swanbourne, and Chipping Norton. I have grown up hearing that my Grandmother was born in Peterborough almost as they boarded the boat to come to the US, but that the origins of the family were in Swanbourne. Both of my cousins had the good fortune to visit the North homeland while in England for work duties. I, however, had expected to bide my time until my children were out of college to avoid having to spend time in the Winslow workhouse, as did several of our North ancestors. However, in celebration of our sons’ graduation from College and High School respectively, we threw the bank book to the winds and headed to Europe to explore our roots. Fortunately when we visited Swanbourne, St. Swithun’s church was open and empty. We took the opportunity to look through a Parish Records publication we found sitting on a table just inside the door listing births, marriages, etc. Even though we had done fairly exhaustive research on our end, it was terrific to find all our information validated in that little publication sitting on that table. Not wanting to appear that we were “casing the joint” we took a quick tour around town and headed to The Betsy Wynne Pub for what turned out to be wonderfully memorable lunch. It was, all in all, a rather emotional time for me, especially when the hostess at the pub welcomed me “Home” after we told her why we were there. We were treated to wonderful local delicacies and brews. I am including the North family tree as we know it. Our first North ancestor in Swanbourne was Peter North who appears to have been born in Chipping Norton and moved to Swanbourne where he married Mary Prentice in March 1794. Three generations of Norths where then born, lived, and labored in Swanbourne until my Great Grandfather John Jason Seymour moved to Peterborough prior to his emigration to Chicago, Illinois with his family in 1881. Many of the North family that settled in or around Chicago, Illinois turned to what we would describe as “blue collar” professions, like machinists and mechanics. 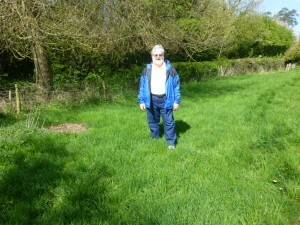 Carl Glaum visits the Petticoat Lane site where his ancestor Seymour North was born (see below). My Great Grandfather Seymour retained his profession of Florist. My Grandmother appears to have stayed at home caring for 11 children after marrying a German Carpenter. After the initial settlement in Chicago the family branched out across the US and into Canada. Professions also include Electrician, Opera Singer, Computer Programmer, Scholar, Linguist working for the Government, and Bank Vice President. From rather humble beginnings the American Branch of the Swanbourne North family has certainly turned out to be a true American success story of which we are very proud. 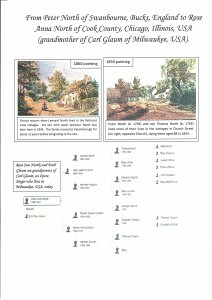 Through the publication of this tree on sites like ancestry.com we have had the pleasure of corresponding with extended family members who have remained in England, although we have yet to connect with family still living in Swanbourne. We are happy to share any and all information we have gleaned over the years. My wife and I look forward to our next visit “Home”. It was a great pleasure for Linda and I to meet Carl and his wife Kirby on Good Friday morning, 2014 (photograph, above). Carl Glaum tree and North family dwellinghouses in Swanbourne. 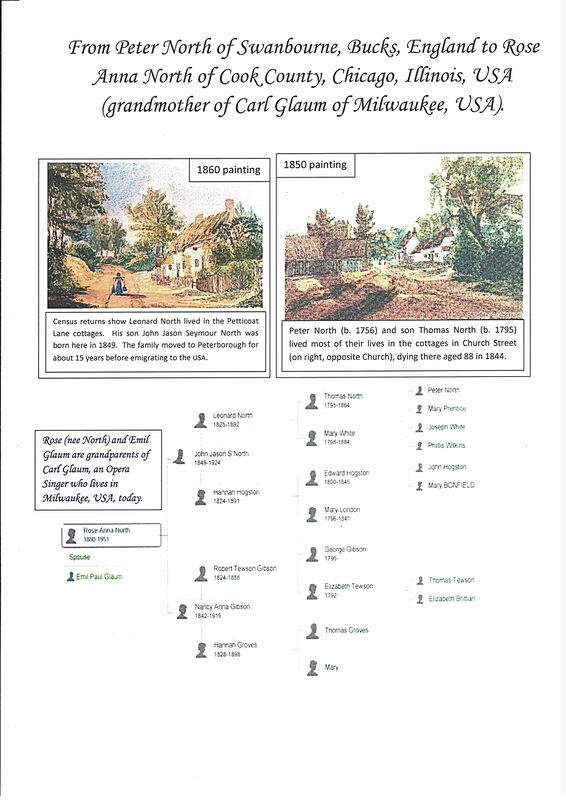 Having previously identified from the Census Returns where Carl’s ancestors had lived in the village, I took Carl and Kirby on a whistlestop tour of the sites of greatest interest to him, aided by copies of Victorian paintings showing how the village used to look. Carl’s ancestral sites were mainly in what used to be called Church Street and Petticoat Lane. On returning to our house, we took coffee with Carl and Kirby, and we explained some of the research that we were doing and how this linked to the North family history. From Peter North (born 1756), North family members had many children and became firmly established in Swanbourne, marrying into the prominent Tofield, Ash and Turvey families. It appears that the North family has now gone from Swanbourne completely, but members of the North family still lived in Swanbourne at least to the latter part of the 20th Century. If anyone in the village knows of any Norths living still in the surrounding villages and they are interested in following up their history further, and/or making contact with Carl, please contact me through the Website email address. We look forward to continuing our friendship with Carl and Kirby.